Do you really need smart home security cameras? Your home is your castle, and you’ve no intention of it playing host to unwanted guests while you’re away. Not too long ago, the most reliable way of protecting your property and possessions from criminal activity (barring buying the biggest guard dog you care to imagine) was to install a burglar alarm system. But these can only alert of and potentially scare off an intruder, and do little more to help catch a burglar after the act has been committed. Today, you have another option, thanks to smart home tech – the smart security camera. TechRadar's Gerald Lynch looks at why you might need smart home security cameras. 'In the past, if the worst happened and your home was broken into while you were away, you had to hope the alarms were working properly, and that a friendly neighbour would notify the police,' says Rob Wells, VP EMEA of Arlo Technologies, which makes security camera systems like the Arlo Pro 2 and Arlo Q.
Arlo Technologies’ own research, speaking to 1,000 UK homeowners, found that smart home security cameras were the most popular way to protect a home, according to 35.1 per cent of the survey’s respondents. This was followed by burglar alarms at 20.5 per cent and smart doorbells at 13.2 per cent. Mobile notifications: the prevalence of connected mobile technology makes their key features incredibly attractive and versatile – most camera systems can detect movement, sending their owners a mobile notification of unexpected activity. Live video feeds: along with the mobile notification comes a live video feed of what’s going on direct to a smartphone. These can act as a ‘silent alarm’ – you know the intruder is present on your property without alerting them, letting you contact the police in the hope of catching the burglar red handed. Video evidence: if the intruder gets away, you’ve then still got video evidence of the crime, and the potential to identify the criminal. That’s before considering other uses, like tracking the arrival of a delivery while you’re at work, or even keeping an eye on pets and local wildlife too. Future potential: the potential that these systems have will only grow as the smart home itself does. Want to check in on your video feeds from a screen-equipped Amazon Echo Show? Plenty of providers allow you to do so. How about triggering an If This Then That (IFTTT) app routine that would see all the smart connected lights in your house flash red when a security camera’s motion detector is triggered, as well as blasting some Metallica at full volume from every connected speaker in the house? It’s possible, and likely to give a burglar a heart attack in the process. What do smart home security cameras cost? As the prevalence of high-resolution camera equipment has spread over the past decade, the price of these systems has fallen dramatically too. For a few hundred pounds you can have a 24/7 feed of your entire property, in HD video quality, with systems so easy to install that you can set them up yourself without a pricey installation fee. What you will however likely have to consider is a fee for the video service itself – most smart cameras store your video in the cloud over the internet to protect it from data loss or damage, and depending on whether you want a few days or a few months worth of recordings stored online, charge a monthly fee accordingly. 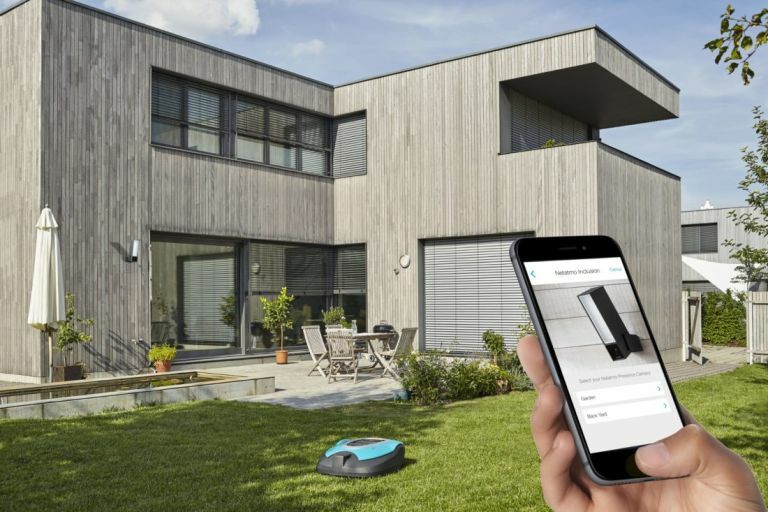 Part floodlight, part security camera, the Netatmo Presence will make anyone think twice about messing with your mansion. Though it’s expensive, it’s sophisticated and sturdy too – designed for outside use, it has a motion sensor which triggers its bulb, bathing the subject in light whatever time of day, allowing for very clear 1080p video recording. That motion sensor is smart too, and able to differentiate between a person, car or animal, to make sure you’re sufficiently informed of what’s going on any time an alert is triggered. It’s an imposing bit of kit, with a boxy metal casing that would be difficult to damage. The Netatmo Presence will certainly make your home look seriously secured. Want something to keep watch on the inside of your house, without turning your living room into something that looks like an Orwellian nightmare? The Logitech Circle 2 is a round, discreet security camera that’s stylish enough to sit among your furniture, while also weatherproofed for outdoor use. Working with Amazon’s Alexa voice-activated smart home assistant, it can record Full HD video around the clock, with an ultra-wide 180-degree lens capturing all that is going on inside your home thanks to motion sensing awareness. You get free access to the last 24 hours of footage recorded and stored in the cloud, with a smart recap system in the software highlighting key moments of activity in a day. With two-way audio, it can also be used to communicate through its app with anyone nearby, too. If you’re looking to pick up a smart doorbell as well (often your first line of defence as an intruder double checks whether there is indeed anyone at home) the Ring Video Doorbell 2 will serve you well. It’s very easy to install and can be flexibly placed thanks to it being powered by either the mains or a built-in rechargeable battery. Its notification alerts are reliable and fast, and the high definition video feeds it provides are always clear and easy to decipher. It also makes use of a wide angle lens, which is far more useful for scanning your property than the narrow views of other options. It’ll play nicely with Amazon Echo devices that feature a screen, and its video storage options are priced affordably too, starting at £2.50 a month.